This week I have been reading metrics on the blogs of Jeremiah Owyang and Avinash Kaushik. One of the issues in social media is there is a tendency to superficially measure results. Some metrics used are number of fans/followers, number of posts, followers to following ratio. All provide no information with regards to the effectiveness of social media. The challenge in social media is that a manager may determine the budget largely by only the 8th while in the long-run all are important. The 8th is also the toughest to quantify. Fortunately, Google Analytics provides some assistance. To determine the conversion rate the basis for measurement it is important to use a landing page. This will help to specify who went to the page as a result of the link or ad. If the webpage is provided in an offline ad, it is even more difficult to quantify, as there is nothing to stop the person from going directly to the homepage. 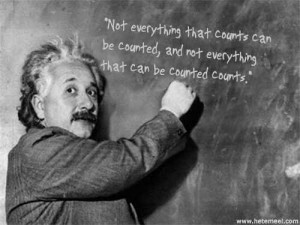 No matter how you do it there is no perfect measure of ROI with social media. Although managers may be quick to jump for it because it is a concise metric that measures the ultimate goal, managers that rely on it can’t see the forest for the trees. This entry was posted in Uncategorized by Matthew Pattinson. Bookmark the permalink.